Liquid flow processes are fast, typically 0.5 sec response or less. Gas flow is slightly slower because of the compressibility of the gas. Control components – transmitter, valve and transmission lines – are the main dynamic elements. The most common measuring means is the orifice plate and differential pressure transmitter ; flow is proportional to the square root of differential pressure. If a centrifugal pump is the flow energy source, the throttling valve can be placed in the pump discharge line. If a positive displacement pump is used , then the valve must be in a bypass line; alternately, pump speed or stroke can be controlled instead of bypass flow. A linear valve should be used in preference to a percentage valve, especially where the pressure drop across the valve varies. This helps counteract the non linearity of the differential measurement. If the measurement is linear (magnetic flow-meter, turbine meter etc.) an equal percentage valve is probably the better choice. Flow processes are determined by noise caused by fluid turbulence and equipment vibration. Controller gain is invariably low usually less than 1.0. Reset must be used to overcome offset, derivative cannot be used. · Most lags are in the control system. · Non-linear (square) measurement common. · Proportional plus reset controllers. · Low gain, fast reset. · Linear valves for differential pressure measurement. · Equal percentage valves for linear measurement. · Valve is the major dynamic element. Liquid – Liquid pressure control is very similar to flow control. The system is non-linear : pressure varies as flow squared. Noise is ordinarily present. Gas – Gas pressure processes are single capacity systems and do not normally present much of a control problem. Self-acting or simple pilot-operated controllers can often be used with good results. (Line pressure is connected to the valve top either directly or through a simple pilot valve.) Gains of these proportional-only controllers are typically 20 to 50 or higher. A pneumatic reducing valve is a simple example of a self-acting pressure regulator. The important secondary dynamic element is the valve – the process itself is usually a large single capacity element and measurements are fast. Distance-velocity lag is not present. Proportional control is usually adequate ; reset can be added to completely remove offset. High gains are generally achievable or moderate gains with fast reset if small offsets are a problem. Vapour – The most important vapour pressure applications involve heat transfer – distillation columns, evaporators etc., where the control system is basically heat balance control. Vapour pressure control loops act like temperature control loops. · Gain near 1,fast reset rate. · Derivative of no value. · Self-acting or high gain proportional controllers. · Valve characteristic relatively unimportant. · Slow compared to other pressure processes. Level is a single capacity, integrating system. The tank, capacitance is directly proportional to the vessel diameter. Large diameter tanks with low thruput present no problem, small diameter, high thruput systems are more difficult to control but not as common. The tank lag is volume thruput. Level control systems fill into two distinctly different categories : precise control and averaging control. For precise control, proportional controllers will provide adequate regulation on large capacity systems. As capacity decreases, controller gain must be decreased and reset becomes necessary. Averaging level systems sacrifice tight control in order to keep output flow rate constant. Typical applications are where the vessels under control are surge capacities between sections of a multi-stage process, their purpose being to absorb changes between stages. Level is allowed to wander between wide limits, with corrective action applied gradually so long as the level remains safely between the limits. Low gain, reset controllers do the job. Special dual-gain or dual-reset controllers are sometimes used. They have low gain or reset in the safe mid-level area, switch to higher gain or fast reset if the level strays too fat. High gain or proportional plus reset controllers. Low gain proportional plus reset or specialised controllers. are heat transfer problems and are characterised by long time constants and slow reaction rates. Distance-velocity lag is common . The measurement lag can pose a serious problem, especially if the thermal system is protected with a well. The measurement time constant depends on the mass and surface area of the bulb (or the well), the fluid being measured and its velocity past the bulb. Special care should be taken in locating the bulb to maximise heat transfer. Temperature control problems are complicated by nonlinearities. Heat transfer processes have parameters which vary with flow, so that time constants and distance-velocity lag vary with load or operating point. Processes dominated by one large capacity – as large temperature baths or air heating systems -can be controlled with on-off controllers. Some cycling results, but is in the order of 1% of the span. Proportional plus reset control is used in smaller capacity systems where load changes are large and where distance-velocity or measurement lags are important. Most shell and tube heat exchangers fall into this category. Derivative is helpful, provided the distance-velocity lag is not the dominant secondary dynamic element. Shell and tube heat exchangers or plate heaters have large effective dead time so that derivative is of limited value. But other temperature systems such as batch reactors are dominated by linear lags and derivative is very helpful. · Dead time possible. (especially heat exchangers). · Settings vary but gain usually above 1. · Derivative of limited value if dead time is large. 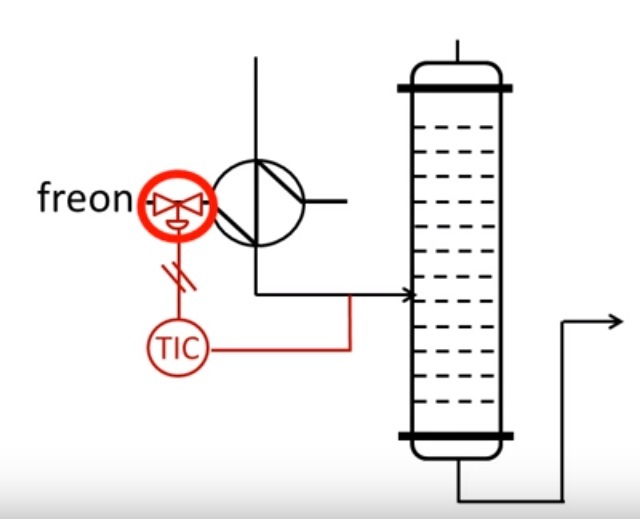 Composition Control can be simple mixing problem (blending of lubricating oils to a desired viscosity), a separation problem (product quality control in a distillation column) or a reaction problem (neutralization with pH control). Generalizing on typical dynamics on-line control is difficult. On-line analyzer promote simpler control. They are relatively fast and do not require sampling systems. however, they are often noisy. Most analyzers are linear throughout their operating range. pH is the notable exception. Sampling systems introduce distance-velocity lag into the control loop and the longer the dead time the tougher the control problem. Sampling systems also require careful design to insure that a sample representative of the total process stream is analysed. Analyzers are normally sensitive devices having narrow spans. The high gain element in the loop forces the controller to have a low gain. Reset is an essential control mode. Derivative is sometimes useful. · Dead time usually present. · Sometimes noisy due to poor mixing. · Low gain, variable reset rate. · On-line analysers fast, often noisy. · Sampling systems complicate both measurement and control, add dead time.